Doug Keyes's photographs investigate the ways that knowledge stacks upon itself over time, leaving an impression or "collective memory." In his first monograph, Collective Memory, Keyes’s luminous color images of books literally revealand sometimes concealthis stacking by capturing through multiple exposure the experience of reading the book. 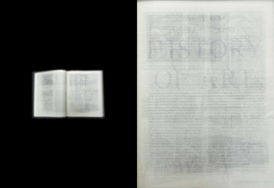 The resulting single image is a condensed document of the experience, the ideas contained within, and the physical identity of the book itself. The books Keyes chooses to photographfrom art books and works of fiction, to poetry books and books on scientific theoryhold personal meaning or remembrance for him and become sites to revisit. Keyes's photographs in fact make visible the pleasure of leafing through a text and the memory of that experience. Doug Keyes was a recipient of the 1999 Ned Behnke Artist Fellowship (The Neddy) and was included in a 2005 exhibition honoring Fellowship artists from the previous ten years at the Tacoma Art Museum, Tacoma, WA. He was also the 2001 Photo Americas Photographer of the Year; a finalist for the 2000 Betty Bowen Award, Seattle Art Museum, Seattle, WA; Juror's Award recipient at the 1999 Northwest Biennial, Tacoma Art Museum, Tacoma, WA (Fred Wilson, juror); and the Juror's Award recipient at the 1996 Berkeley Art Center Annual, Berkeley, CA.